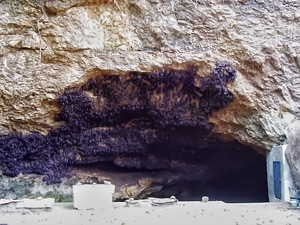 Ngerong Cave is a cave which dwelt by many bats. From the cave mouth, it flow very clear river so we could see thousands of fish that had the strange hobby. They are like to eat capok tree seeds and did not run when being held by the visitor. This kind of cave was difficult founded in the other area, moreover its location was adjacent to the highway about 30 km from the centre of Tuban city southeast and the location is in the capital of Rangel district. People around this place believe that there is a mystery of this cave. Eventhough the fishes are massive, no braves to take fish from the river. They believe that they will get unfortunates or will be cursed by the devil that is keeping this cave if they take fish from this river.